The large mound is the remains of a motte and bailey castle, believed to have been built by Cadwallon ap Madog in the 12th century. The woodland is exceptionally important for its ancient pollarded oak trees. These are considered to be up to 450 years old and are amongst the oldest trees in Radnorshire. The largest has a girth of over 6.3 metres. Pollarded trees were originally sustainably 'harvested' for timber by cutting branches at a height that was clear of the attention of browsing animals. This 3.9 hectare ( 9.6 acre) dingle woodland was purchased by the Radnorshire Wildlife Trust in 1998 with support from the Heritage Lottery Fund, being extended in 2002. 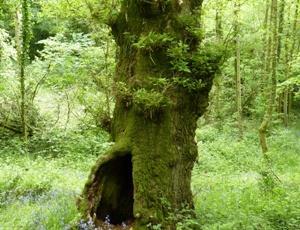 Ancient trees of this age are one of the rarest habitats in Europe and the UK has a large proportion. They support a range of rare and declining species of epiphytes (plants, including mosses and lichens, which grow on other plants). Over 100 species have been identified on the reserve. In spring the reserve is a carpet of wild flowers. Bluebells dominate large areas. Yellow Archangel, Cuckoo Pint, and Moshatel are frequent throughout the wood with Wood Anemone, Sanicle and Ramsons are scattered throughout. Alongside the stream there are a few patches of Alternate-leaved Golden Saxifrage. Early Purple Orchids occur in several places and Tenby Daffodils have become naturalised here. The scrub on the motte is an important habitat for birds, including Yellowhammer, Blackcap and Garden Warbler in summer. In the woodland many species typical of oak woods nest , including Nuthatch, Great spotted Woodpecker and Pied Flycatcher. Buzzards commonly roost in the woodland. The large mound is the remains of a motte and bailey castle, believed to have been built by Cadwallon ap Madog in the 12th century. The woodland is exceptionally important for its ancient pollarded oak trees. From Clyro village take the unclassified road North, up the hill, just before the main road through the village joins the A438. This road would eventually lead to Painscastle. After about half a mile there is a track to Court Evan Gwynne on the right and the gateway to the reserve is on the left side near the start of the track. Park here avoiding obstruction to the track.